We all know students are resistant to poetry. Maybe it's because it takes real brain power to understand and appreciate it. Maybe because they've sadly been forced to read poetry silently and haven't been able to learn to enjoy it. I don't know about you, but students reading poetry outloud makes me cringe. And when I read it aloud, I don't do it justice. So, in honor of April being National Poetry Month, I have compiled for some of my favorite videos and audio recordings that bring poetry to life. The next time you teach or use a poem, pick one of these, and bring it to life for students with an amazing reading or visually supportive video. Below are six of my favorites. Next week, I will be sharing six more picks. What high schooler doesn't love Breaking Bad? (Or teacher for that matter.) In this teaser trailer for the final season of the show, the preview is set to Walter White himself reading Shelley's poem. For students that are familiar with the show, ask students to consider why the poem is a good fit for the show or the character of Walter White. For those who want to stay away from the show, analyze how the visuals presented in the promo enhance the theme or mood of the poem. Or, perhaps look at the symbolism in the clip. This iPad Air commercial features a reading of Walt Whitman's poem by the late Robin Williams, taken from his reading in the film The Dead Poet's Society. 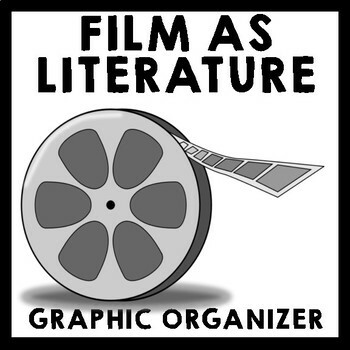 For this clip, you could have students analyze the mood or theme and how it is supported by the visuals in the commercial, as well as how the poem relates to the purpose of the commercial. Also, if you watch The Dead Poet's Society in class, don't forget to pair it with this! Levi's put out a series of poetry-based advertisements for their "Go Forth" campaign, and this is by far one of my favorites. It features a wonderful, modern poem that is perfect for analyzing theme or pairing with other "carpe diem" classic poems. It might also be a cool task to analyze all of the advertisements in this campaign together as a whole! One more is posted below, and I'll post the other ones in next week's post. Here's another one of Levi's commercials, this time to a lesser known Whitman poem. This would be great for analyzing what the poem is trying to say about America as a country, as well as analyzing the effect the black and white visuals have on the tone. You may know singer Jeff Buckley from his rendition of "Hallelujah." In this audio recording, the musician reads Poe's poem set to music to create a true ethereal and haunting atmosphere. Great for musically inclined students and for analyzing the mood of the poem. I remember hearing this in college, in a class on Poe that I took, and it has stuck with me since. Here's two spectacular choices for this classic poem that we often teach! One is a clip of a partial reading of the poem in the new movie Interstellar. This would be great to connect the theme of the poem to outer space travel & missions, especially since the poem is about death, it would be great to look at the meaning from a different direction. I also am a huge fan of Anthony Hopkin's reading of the poem - that voice! Also, this particular YouTube video pairs the reading with some visuals. 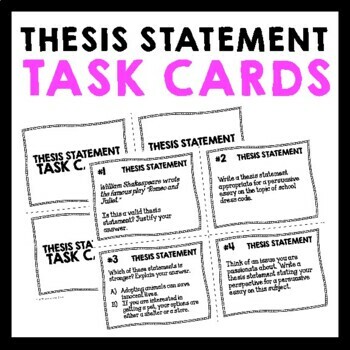 Hope you will find some of these interesting and usable! When trying to obtain audio readings for the poems you are using in class, I suggest checking out the audio library at Poetry Out Loud. I had really high expectations for this book: I loved Draper's Out of My Mind, I was excited to read a book dealing with the KKK, and I am a sucker for a great title and beautiful cover. I was hoping that this would be an awesome book to buy a class set of and teach. Unfortunately, I was disappointed. Now, it may just be me. 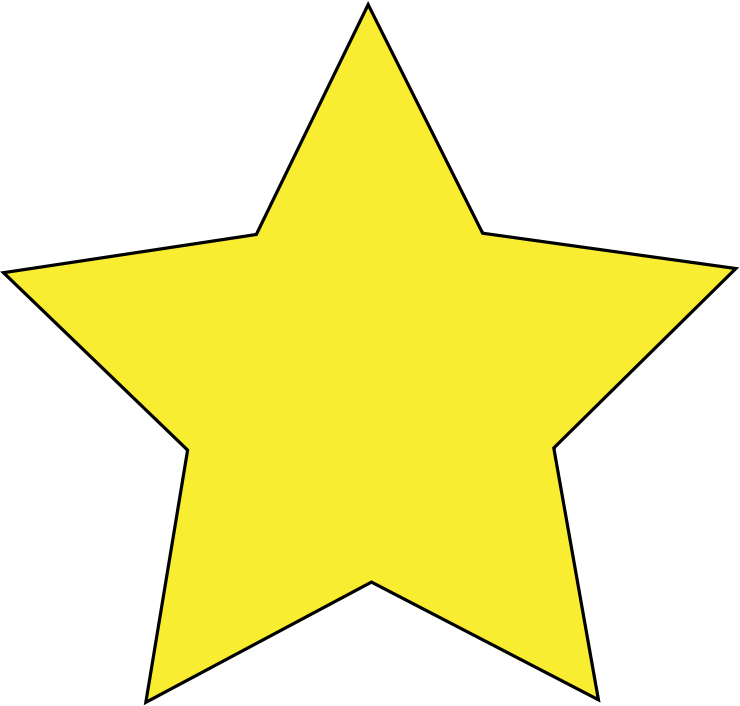 Looking at Goodreads, I'm noticing that most reviewers gave it 4 or 5 stars. But for me, I found myself dragging to get through it, and more than once, rolling my eyes at the dialogue. I felt like the characters were one dimensional, and I often felt the dialogue felt forced and unnatural. Stella didn't seem to sound like an authentic little girl to me. I was also disappointed about the inciting event Stella witnesses that was teased in the book's description. I was hoping it would be something significant, maybe a nighttime clandestine meeting between a black and a white, or perhaps an act of violence against a black. Yes, I know it is middle grade fiction, but I was expecting some exciting, just toned down for the age group. Spoiler alert: The big event teased was that they saw the KKK meeting and burning a cross. Yawn. That being said, this is an important era in history that students need to be exposed to, and its definitely worth a read for teachers and middle school students alike. It just didn't do it for me. 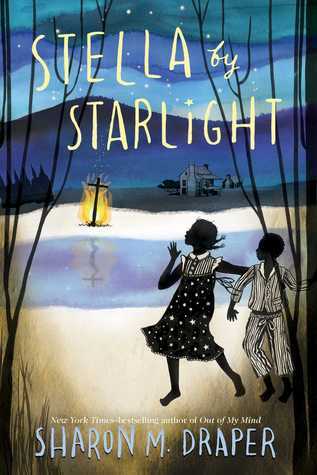 Classroom Application: Buy a copy for your classroom library, add it to students' independent reading lists, or get a small set for a Literature Circle/Book Club group on the theme of racism or that era of history. It's definitely worth a spot in your classroom, but I don't think it's the best novel to buy a class set of and teach. Recommended grades 5-8. "Peep' into my store on Easter Day (Sunday, April 5th) for a 20% sale on all of my items! This is a great time to stock up on novel or short story units as the year winds down and we start planning for the next. Many other sellers will have their stores on sale as well, so catch the savings while you can! 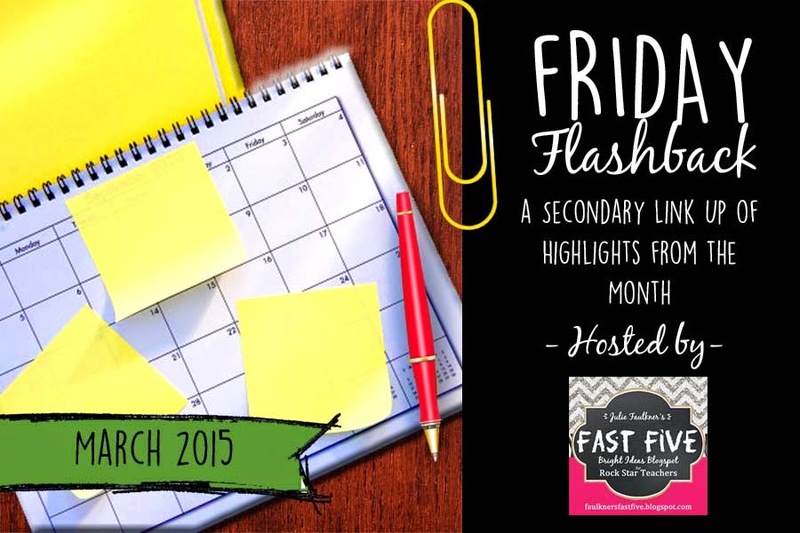 It's the last Friday of the month, so I'm linking up with Julie Faulkner of Faulkner's Fast Five to share the top 5 highlights from my month with you. 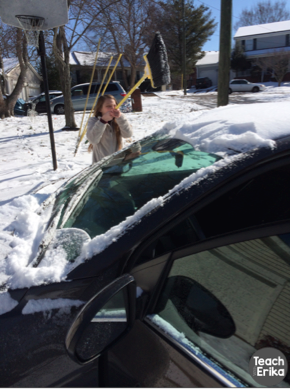 "broom method" to clean off my car. This has been a big year for Tennessee teachers. We've had a grand total 11 snow days in my district!! Two of them were this month. They were life savers for me, because it really helped the count down until my last day of teaching fly by! Also, amazingly, two of those snow days I had previously scheduled a sick day for. That worked out nicely! Now, as a lifelong Michigander, I do laugh at the snow and ice days we have in the South and how people panic. But I certainly am not going to complain about having them! 2. I quit my teaching job at Spring Break. My very own Tardis card. This was a lifechanging, and absloutely agonizing decision for me. I'm going to do a separate post on this soon, but I worked in an extremely sick building and my room was covered in mold. I had been chronically ill for the year and a half I spent in this building, and the district refused to clean or replace the light fixtures it was growing on. Things are difficult for teachers in Tennessee and I simply cannot describe what was coming down from the top to be put on the backs of teachers. In addition, I found that my highly-sensitive person personality was not cut out for managing classrooms of 30+ kids while under extreme pressure. It became all too much, and even though I knew I would be done teaching this year since last summer, I finally found I couldn't wait out the last two months. Since the beginning of the year, I became severely depressed, gained weight, my anxiety issues were multiplied tenfold. I regularly fantasized that I would be assaulted by a student or fall down the stairs and hurt myself so I could go home. Every morning I dreaded going to work and felt like throwing up or just throw myself out my second story classroom window. (Not really. Sorta. Still would be preferable to work). Now I feel like the weight of the world is off my shoulder's, and I can't wait to see what the future brings. I do have to say my students gave me the two most amazing surprise going away parties and I bawled and bawled like a baby. Apparently the kids worked SO hard all week to secretly prepare them for me! I couldn't believe the effort they put into it and it was definitely an amazing wrap up to my 4 years of teaching. 3. Real estate, here I come! half this put together when teaching. I've had my real estate license since this summer and have been signed on with a brokerage since then. 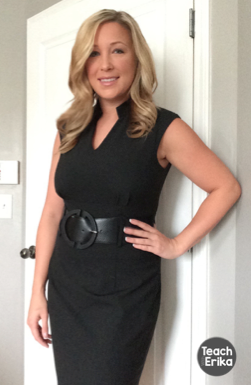 So, I guess you could consider me a previous part-time real estate agent. However, I didn't do anything with it during the school year because school just overwhelms me and I had been so ill from the mold in my building. Well, now I am going full time in real estate! (Well, plus full time with TPT, so does that make it part time and part time? But besides teaching/creating Language Arts materials, real estate has always been my other passion. When I was a kid, I would draw subdivisions and floor plans and then "sell" houses to indulging family members. So it's in my blood. I'm excited to get going. I have product creation ADD. I'll work a little on one product, get bored or get an inspiration, and work on another. I have a folder with I think at least twenty just started, halfway done, and nearly at the end products. One day they will see the light of day! Because of this ADD, I haven't been able to crank out products as quickly as I had hoped. 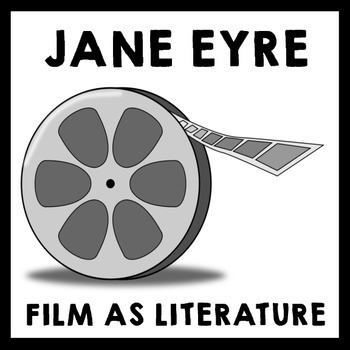 However, I have made a couple of new ones this month: A FREE "Film as Literature" graphic organizer for any movie, and a specific one with detailed answer key for the 2011 film version of Jane Eyre. 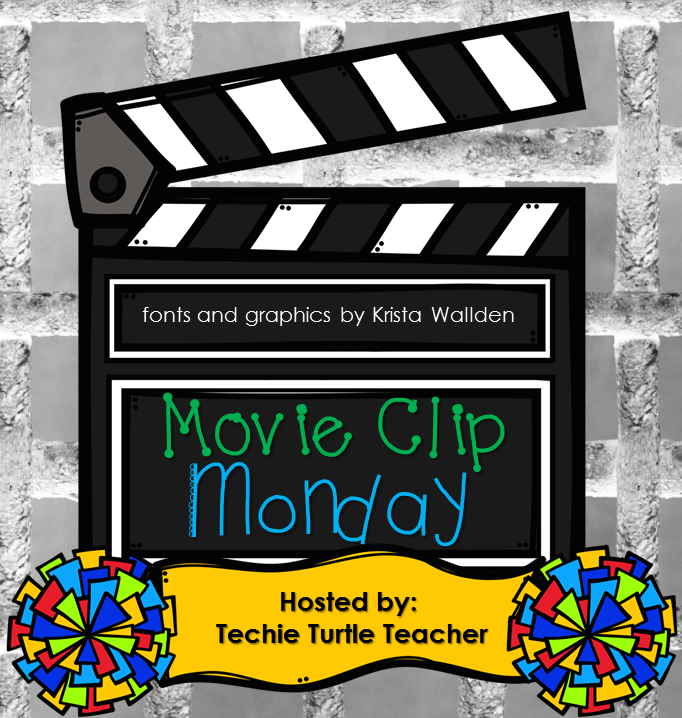 The freebie would be great to leave with a sub or to use during the eventual end of the year movie time. In honor of March being Women's Rights month, for this Movie Clip Monday I would like to share with you this AMAZING women's suffrage parody of Lady Gaga's Bad Romance. It is amazing all around and perfect to show suring morning meeting or before reading or studying about women's history. The creator of the video, Soomoo Publishing, has a website dedicated to it with lyrics and even assignments on women's suffrage. You can access it by clicking here. Admit it: There isn't anyone in this world who doesn't enjoy window shopping. I don't care what it is - clothes, shoes, purses, electronics, furniture. We see it, we want it. Same goes for TeachersPayTeachers. 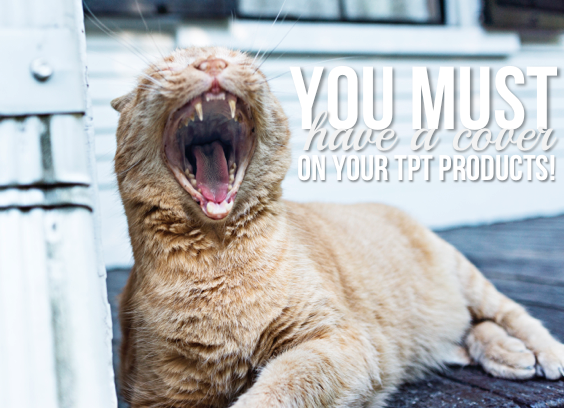 TPT is the ultimate window shopping experience. 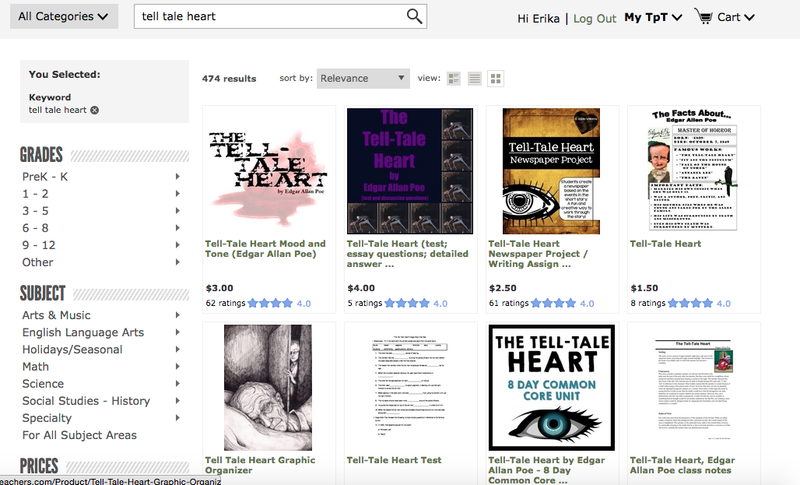 When you search for something on TPT, you will get thousands upon thousands of results. That's a lot of competition! Getting your product to show up on that first page is another battle - is the buyer really going to click through page after page of products, magically drawn to yours? Likely not. But let's say your product does show up early in the results for your buyer. If you can't get your buyer to click onto your product to read more, you've already lost. The odds are not exactly in your favor. So how do you increase your odds? You. Must. Have. A. Cover. I'll say it again. You must have a cover! And an eye-catching one at that, but that's a topic for a whole 'nother blog post. So many newbies, myself included at one point, pooh-pooh at covers. We didn't have time for it. We had the attitude that "My product is so great, it doesn't need a cover!" 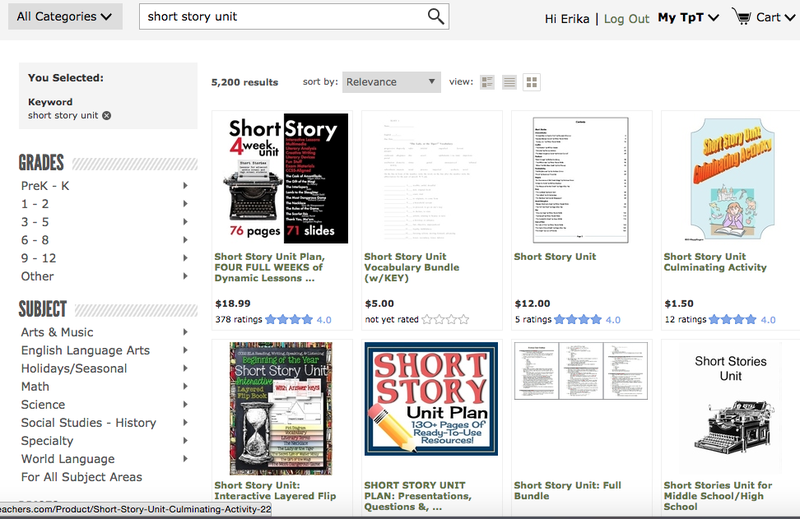 Have a look at a sampling of my search for short story units. What do you notice? What sticks out? I'll tell you what I notice. The first product in the top row, and the first and second products in the second row. I don't care what order they came up in. I'm going to click on one of those to find the resource I need! My eyes completely graze over the coverless products (second and third items in the first row and the third items in the second row), and my eyes just give a slight glance to the other two products that are not as well designed as the former ones. Those poor, lost products don't even stand a chance. I don't think it's a coincidence that those three products my eyes are drawn to are from top sellers on the site. Let's look at some more searches. Here's one: Tell Tale Heart. There's my product in the line up with the big blue eye. Again, the covers stick out. Honestly, I would click on the first one or the third one in the top row, or mine. The second cover in the top row is too dark for my poor blind eyes to make out. The picture is just a scene from the story so I'm not terribly interested in it. The coverless products don't even stand a chance. Let's try one more. 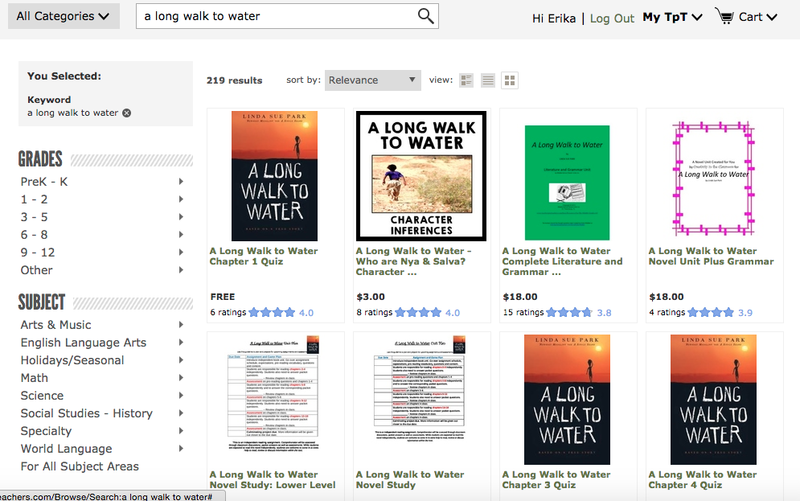 Now I'm searching for the novel "A Long Walk to Water." Can you spot my product? Discuss with yourself: what would you click on? If you are a newbie, challenge yourself. Do some searches and analyze what jumps out at you as a window shopper. Do your own products jump out at you, or are they lost in a sea of coverless items? You need a cover. It doesn't have to be great - everyone's covers start out bad. They get better with time and practice. But you definitely need to start adding covers to your products. Do it now! I think you will see a fast improvement in your sales. More to come on TPT covers. If you are thinking of selling your own items on TeachersPayTeachers (WITH covers of course), I would appreciate you clicking through and signing up under my referral link. Ready to sell on TPT? Click here! I don't know about you, but holidays are rough for me at school. It doesn't matter what holiday it is, or what day of the week it is. The kids are just riled up. It doesn't help that in our district, prepping for the state test is the only thing that matters. There isn't time for parties or celebrations or even fun projects throughout the year. Our kids have nothing to look forward to. So, at my school, St. Paddy's day isn't a time for green treats and craftivities. It's just a normal learning day. St. Paddy's was also supposed to be the last day of school before Spring Break, until snow day makeups got added onto our week. That would have been a nightmare day. My solution for holidays when you need to keep them working and focused: History.com Webquests. 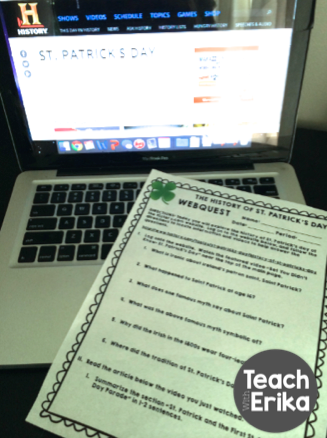 My three-page webquests for a variety of holidays (I am still in the process of making more) engage students in research, discovery, and writing. They are on the computers (which they love), and because they have to watch videos to learn information during the webquest, they are wearing headphones and are very quiet (which I love). They are also searching only the History.com website, so no need for all the questions like: "Can I use this website?" "Miss, is this website a good one?" "Where do I go?" Ugh. This activity would be great for ELA because of the research, critical thinking questions, and writing. 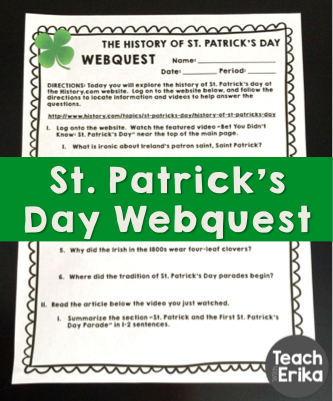 It would also be great for Social Studies because they're learning the history behind a widely-celebrated holiday. Why not print out your work for the day on green paper? Green paper makes everything more fun. Click here to download this product from my store!